The Islamic State's Egyptian affiliate claimed responsibility on Thursday for a bombing that struck an armoured military vehicle in North Sinai, killing four soldiers. An army spokesman said earlier that an officer and three soliders were killed and three others wounded when a roadside bomb hit their armoured vehicle in a village near the restive town of Rafah, a site of a rising militant insurgency. Sinai Province, which has pledged allegiance to the Islamist State group, claimed responsability for the assault in a statement posted on Twitter. It was not immediately possible to verify the authenticity of the statement. The militant group, Egypt's most deadly, claimed a missile attack last week on an Egyptian navy boat off North Sinai--adjoining Israel and the Palestinian Gaza Strip. It also said it was behind a powerful bombing that hit the Italian Consulate in central Cairo a week earlier. 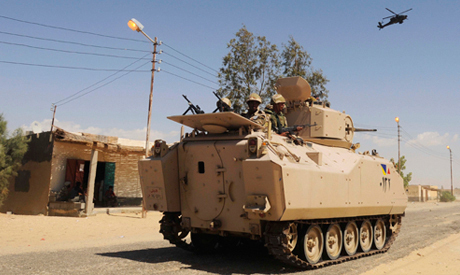 Egypt's army is fighting an Islamist insurrection based in the northern part of the Sinai Peninsula, which has heightened since the ouster of Islamist president Mohamed Morsi in July 2013. The violence has largely targeted security forces, killing hundreds over the past two years. Seven soldiers were killed on Saturday when a shell struck a military checkpoint in North Sinai, according to a military spokesman. Operations by troops during the day, which involved air strikes, left 59 militants dead. Earlier in July, 21 soldiers were killed during simultaneous militant assaults on army checkpoints in the North Sinai towns of Sheikh Zuweid and Rafah, an attack that prompted days-long fighting between troops and insurgents and left over 200 militants dead. The attacks, the bloodiest in the region in years, were also claimed by the militant group. RSB used in Iraq by Iranian agents. Americans have wide experience against it. You may use high frequency band to explode it or just heavy rollers to blow it out. You may lease spy satellite o really improve security and identify Islamic militant cesspools along the border. I hope army hydrologists flooded the underground tunnels. Tunnels are interconnected. You flood one and all will be done. .. "IS claims responsibility" ..... NO PROBLEM..WE'LL TAKE CARE OF YOU..DAESHE OR BROTHERHOOD...OR AL QUAEDA..OR ANY LONG BEARDED TRASH..SOONER RATHER THEN LATER...LONG LIVE EL-SISI , EGYPT'S GREATEST . Egypt is in a struggle of the good to conquer the evil.Your President Al-Sisi and Egypt Armed forces will face many challenges in coming days and months and years. These gangs are murderous trash. Please dont waver for 1 second. Destroy them for the sake of the entire world .You deserve the support of all neighbours and wider M E and world .May Egypt be blessed in its righteous struggle. I know what you gonna say. We will crush the evil forces and their supporters for sake of Allah (SWT). The pathetic day dreams and wishful thinking of a Muslim brotherhood. The sad life of the Muslim brotherhood terrorist organizations members meaningless life.